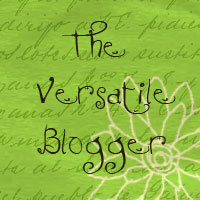 > This award is the Versatile Blogger award and it comes with a few rules. 1. I’m a military veteran and served in the second Iraqi War. 2. My favorite anime is The Ouran Host Club. 3. My second child came into the world after only 7 minutes and the doctor almost didn’t make it. 4. I’m TERRIFIED of clowns. 5. I wanted to be a Marine Biologist since I was 10, but I’m afraid to swim in the ocean. 7. I’m freaked out by spiders, centipedes and roaches, but I LOVE reptiles, especially snakes. « Bring a little real life to the imaginary. >Cool, I always like learning new stuff about people. 3. 7 minutes? Wow, I thought my 19 minutes was fast. The doc didn't make it for mine, the nurses delivered him. 4. You are a wise woman. Clowns are evil. Congrats on the very well deserved award. >Congrats on the award! And wow, 7 minutes! That one REALLY wanted to be born, huh? >You are TOO sweet! We love your blog, too 🙂 Thanks for the mention! Wow, interesting random things about you! This is great. >Oh jeez, I don't look at your blog for a few days, and look–now I'm rude! Thanks for the award, darlin'! I'll be happy to pass this one on!